If you are a fan of Jessi Kirby be sure to read any of Morgan Matson's books!! Since You've Been Gone has to be a perfect mixture of friendship, romance and learning about your identity. These are some of the reasons why this is definitely another favorite contemporary reads of this year. I loved Second Chance Summer because her characters feel so real and connect with with what they are going through. Matson writes so strongly that the story will instantly pull you in and with her new release about friendship. Emily is shy, and nervous around boys when we first meet her in the beginning. When Sloane left without telling Emily, she leaves her with a list that Emily must complete that are out of her comfort zone that she must force to challenge in her life. They force her to face head on and also to grow. That is one of the reasons why I loved this book so much because it's about personal growth and how to improve on what you want to change. Emily also had a little help with the list with Frank Porter. The romance was so sweet and adorable! Frank is also dorky and sweet that once you put him and Emily together they were hilarious! He liked to push her out of her box, but was also there to support her when she needed the help. All the other supporting characters were great because you got to see Emily experiencing new friendships. Her family is also very quirky because they are writers but I thought they were fun parents who supported their daughter. You also get to see her friendship with Sloane also grow when flashbacks of the past came but it also helped her grow into the person she is by the end. Since You've Been Gone was a great read! 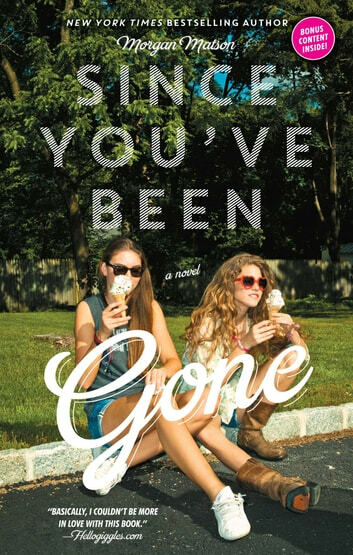 Morgan Matson has become one of my favorite YA contemporary writers because she makes it worth reading since it is addicting how fast you can read it. The book is about friendship, growing up and changes that can happen to anyone. It will make you laugh and cry that you will fall in love with the story! Can't wait to read what Matson writes next!! This book had me holding my breath until the end. It was so amazing and it made me happy! Overall, Since You've Been Gone was one of those books where you want to read again and again! Emily, one of the main charaters, and her best friend, Sloane, are the best of friends. Until Sloane goes missing. Sloane snds Emily lf a lkst of 13 things that she needs to do this summer from riding a horse to skinny-dipping in a lake with her friends. Emily believes that if she completes this list that Sloane will come back. So Emily, Frank,Collins, and Emily's new friend Dawn, are determined to finish the list to get Emily's best friend back. But you'll have to read the book to find out if the fnishehlist and Sloane came back, or if they gave up half-way through and she came back anyway. Read the book to find out!! I just loved this book.Well i like al books but this is one of the best i have ever read .Love and suspence.I si recomend this book!!!!!!! !